Here’s another quick summer meal that can put the garden to use! Bring a large skillet to medium heat. Drizzle some olive oil in the pan (I like to use a combination of olive oil and butter). Sauté the shrimp until it is fully cooked and has a nice golden color. In the meantime, you can get the sauce started. If you are using fresh tomatoes, cut off the stems, peel the skins and squeeze them over the sink to remove the seeds. * Heat a small pot on medium heat and saute the onions and garlic in a little olive oil for a minute. Dice the tomatoes (it doesn’t have to be tiny pieces) and add them to the pot. Add the basil, fennel, red pepper flakes, oregano, thyme, salt and pepper. Simmer for about ten minutes (or until the liquid is reduced). *Here’s a trick I learned from my mom to easily remove the skins: put them a pot of boiling water for a minute! Add the tomatoes and white wine to the shrimp and simmer for several minutes on a medium-low heat or until the liquid is reduced. If you are using canned tomatoes, add both the tomatoes and seasonings in this step. 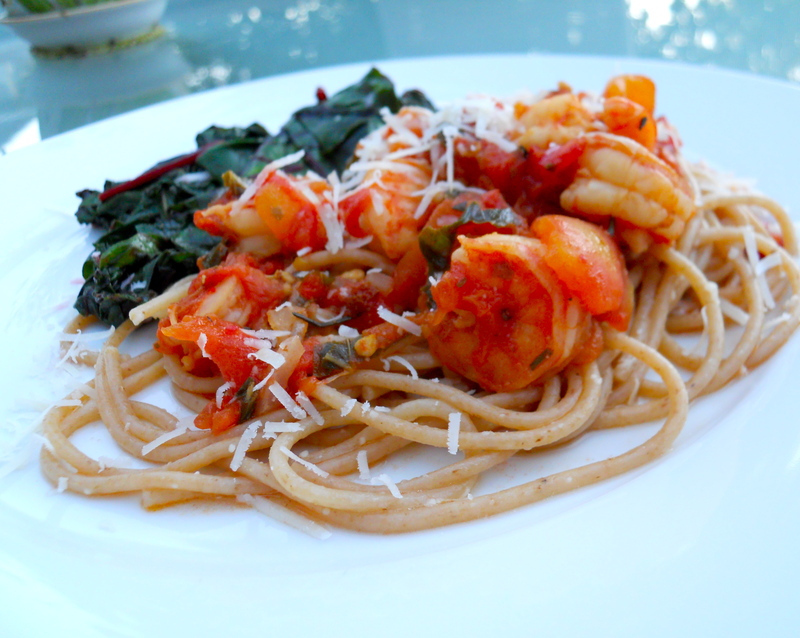 Serve on whole wheat spaghetti, angel hair, or farfalle (bow-tie) pasta with some fresh parmesan on top. The amounts above should serve four adults. Enjoy!